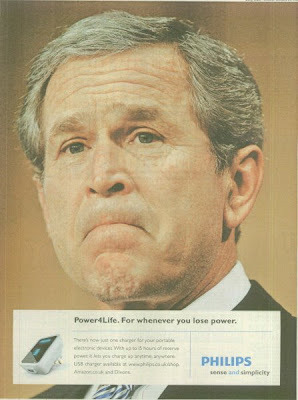 Philips George Bush 'Power For Life' tactical ad - for whenever you lose power! The Philips George Bush 'Power For Life' ad plays on the idea, expressed by New York Times columnist Maureen Dowd on BBC news show Newsnight last night, that today's celebrations are as much about Obama becoming President as they are about George Bush leaving. Topical ads always capture the attention and the Philips George Bush ad is a great example of the long tradition of tactical newspaper ads in the UK. Full story in Media Guardian here.